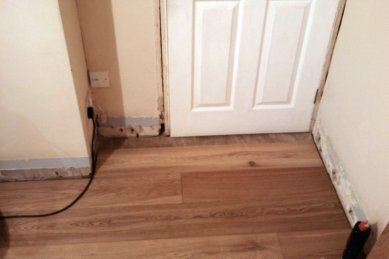 How to lay laminate in a doorway continuously and without any amateur looking gaps! During the flooring installation laying laminate in a doorway perfectly is not so difficult when you start laying the floor boards at the wall that has the door in it. 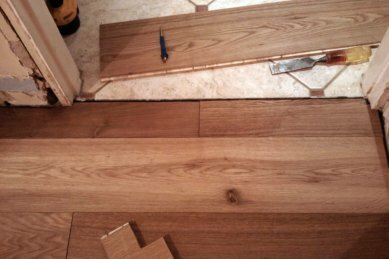 But, when the last few floorboards of your laminate floor need to be laid under the door jambs or through the door lining or door-frame it seems impossible to get them in without leaving any visible gaps! Because you are a pro and are doing the job properly, you'll be installing the architraves & fixing the skirting boards afterwards for a seamless install (if the job is a refurbishment or renovation, take the existing ones off carefully so they can be refitted afterwards). 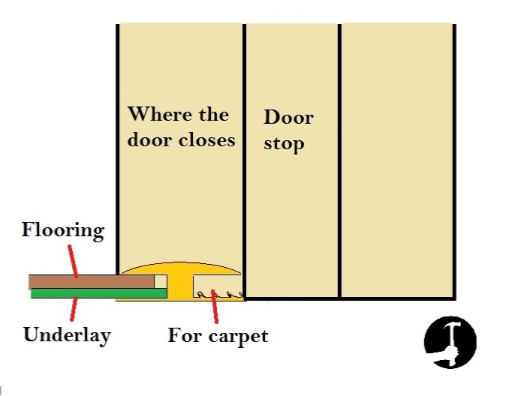 In case you haven't seen it on the previous page and unless you are laying a continuous laminate floor, the sketch below highlights how the threshold (that covers the join between the two rooms) should finish at the door way - it is tight in between the door jambs & also central underneath the door. I have seen DIY flooring attempts that have finished differently to this meaning when the door is closed, you can see the hallway carpet in the bedroom or the other way around for example! By making sure the threshold is hidden when the door is in its closed position you can prevent that happening. When the floor is finished, you shouldn't be able to close the door and see the floor covering that is in the next room! When trying to lay the floor neatly at a doorway, where do you start!? If you followed my step by step installation guide you will have cutting door jambs / linings off in preparation before you start. The biggest hurdle or question I get asked, is "how do you get the floor board tongue to click in and lift the laminate floor up high enough to slide and 'click' it into the previous boards groove - when it is tight under the door jamb!?" It is possible, and can also be easy if you take advantage of the 10mm expansion gap you need to leave around the perimeter of the room. 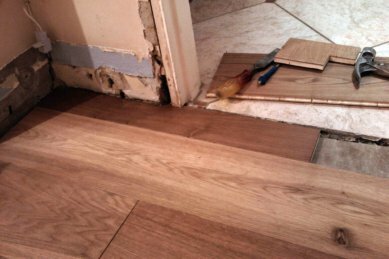 It is no accident that your expansion gap is 10mm, and your tongue and groove are usually 10mm as well (almost always the case on laminate floors, hardwood floors and engineered floor boards as well). Floor boards are designed like this purposely. It means that because you have to leave a 10mm expansion gap between the floor board and the wall, you can slide the floor board into that gap so it is tight against the wall, 10mm past its final position (allowing it to drop down flat). Then, when you slide it back 10mm inserting the tongue into the groove & closing the join to the other board you then instate the 10mm expansion gap between the board and wall/frame. For click together boards rather than traditional tongue and groove, you don't need to lift the board up to click it into position if you use a block plane to remove the ridge on the top of the tongue that stops it coming apart, like in the picture below. All this does is change the board from a click together system to a 'normal' tongue and groove set-up which is perfectly OK, as long as you use plenty of wood glue on it, I would generally use PVA or Gorila glue. Important: don't remove the tongue! Just the raised ridge on the top of it that holds the join together. 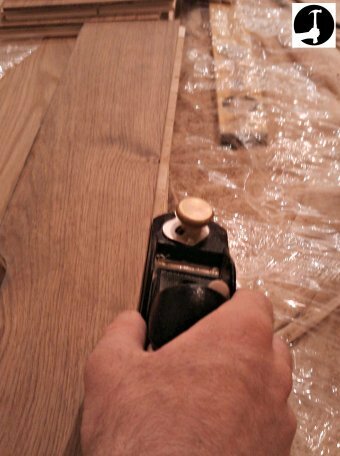 Once you have removed the ridge, test with an off-cut that it slides in and out OK on another off-cut before trying to install it. If you don't have a block/smoothing plane you can use a sharp chisel or Stanley knife to remove the ridge carefully instead. In this first example I had to work out how to lay laminate flooring in a doorway continously because the same floor was in the hallway and the downstairs toilet (WC). Not only that, the plinth blocks are already installed and decorated as well making it a little more tricky. The walls are stud work, plasterboarded and skimmed. Because both the hallway and the bathroom were fairly small I didn't need to have a threshold at the doorway. If I'm laying a floor in two larger rooms I always use a threshold because you need that expansion gap. All I had to do was set-out the position of the door jamb and plinth blocks onto the next floor board and add 7-8mm all the way round the outline so there would be no gap once I slide it under the door frame, architrave and plinth block. Sometimes to make my job easier, I may make a bigger expansion gap by chopping a bit more of the door lining or plaster out behind, where it won't be seen later (normally because it will be covered by a skirting board or architrave for example). Slide the board in under the frame, until it drops down flat and then close the join up. Because I'd planed the ridge of the tongue off It slid over really easily. Just make sure you put loads of wood glue on the join. Once finished, it looks as though the door jamb etc. were fitted last, not the laminate floor! 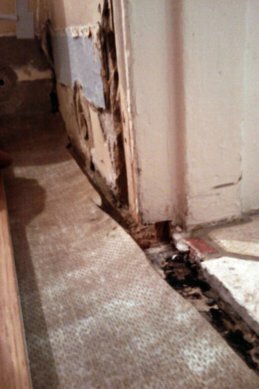 In this next example I was laying laminate in a doorway of an old house that I had installed a kitchen in. This is probably a slightly harder example of getting laminate in a doorway neatly but was still possible and looked great when it was finished. Because this wasn't continuous like the first example, step one of laying laminate in a doorway like this is to mark where the door threshold will be (under the centre of the door when it's in the closed position). Look at the underside of the door bar, you'll be able to tell where the floor needs to stop in order for the to fit over it. Transfer this onto the door lining. Mark a 10mm expansion gap back from this point. The picture below is terrible quality - apologies. And the door frame is very old and battered from years of traffic and several coats of paint. You can just about see the floor stops about 80-90mm before the door and needs to go a little past that so it is half way underneath it. There is not much room to manoeuvre. However the only way in this instance was to have a join in the boards. The first board was to be installed to the left, cut to the length of the same gap between the door jambs. I put the first one into the groove, slid it right over to the left so there was room to get the second one in flat and then slide the first one back over to it. Cut the first piece in to fit leaving the expansion gap and again plane some of the ridge off of the top of the tongue to reduce the friction that stops it clicking in and sliding from left to right freely. You still want it to hold, just slide left and right more freely. The way I choose the first bit to put in, is to figure which board I can slide the furthest so it's out of the way of the next one. You can see I've cut the bottom of the door lining right out the way like before (only where it won't be seen when the skirting and architrave are back on), and I have even chopped a bit of the plaster out the way too so I can move the board too far over to the left. Again, the plaster at the bottom will be covered with the skirting board later. Put the first board in dry, and put it exactly where it needs to finish up. Now mark the second board out. It needs to fit such that there are no gaps, will slide under the door lining and there will still be a 10mm expansion gap. This may mean cutting more door lining, skirting out and/or chopping plasterboard or plaster out underneath where it won't be seen. Laying laminate in a doorway is slightly easier if like in this case you're renewing the architraves and Skirting boards but it is still possible when they're left on. 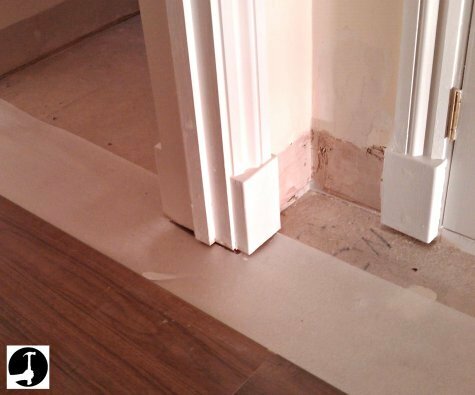 Even if you are keeping the skirting and architrave, it may help to just pop them off temporarily and put them back when the floors down. Provided you'll be able to remove them, I always try the boards dry first to make sure they fit & then remove, glue both of them up loads and slide them back in. Slide the first board back up to the second and close the gap up. This creates the expansion gap on the left corner as the same time. As you can see below (just about the pictures are crap! ), both final floor boards are fitted in underneath the door jambs. There is a 10mm expansion gap between the floor and the tiles in the next room and there is an expansion gap between the boards and the walls. 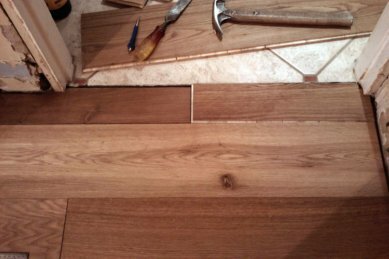 Use the comments section below to add your own tips for floor laying laminate in a doorway?